Japan is a world leader in designing, building and operating advanced energy from waste plants, having more than sixty years-experience. 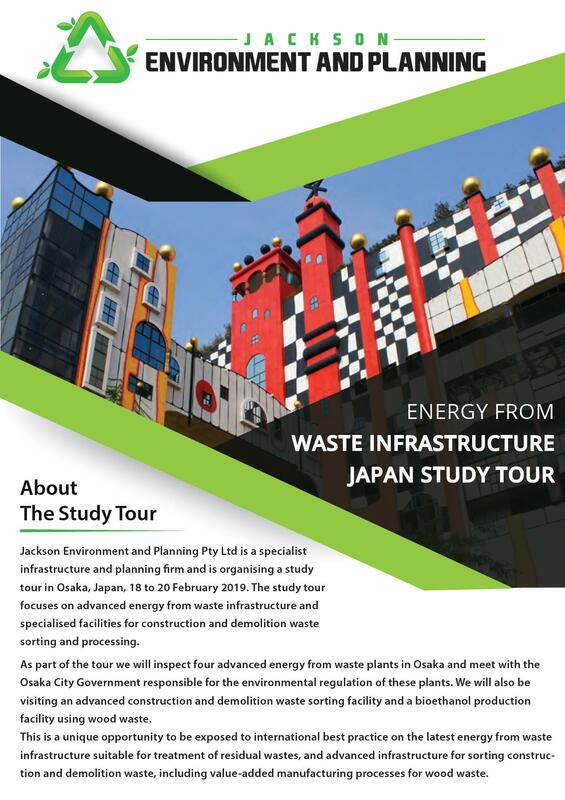 To help in the transfer of knowledge to assist in developing world leading facilities in Australia, a study tour of energy from waste facilities is organized for 18-20 February 2019, in Osaka, Japan. As a nation, Japan has built a network of more than 1,100 energy from waste projects, and landfills just 1% of municipal solid waste. Heat recovered from municipal and commercial waste after recycling helps supplement their national energy requirements. After the NSW Upper House Inquiry into Energy from Waste Technologies in March this year, there is a critical need to help inform decision makers, community stakeholders and investors on world leading technology that is suitable for Australia. Deployment of world leading technology, complying with all planning and environmental laws is crucial to help in the approval process for these projects – and gaining a ‘social license to operate’ from the community. Our team has led two successful study tours of advanced energy from waste plants in 2017 and 2018 in Tokyo, and we are now moving to Japan’s second largest city, Osaka. As part of the tour we will inspect four advanced energy from waste plants in Osaka and will meet with the Osaka City Government responsible for the environmental regulation of these plants. We will also be visiting an advanced construction and demolition waste sorting facility and a bio ethanol production facility using wood waste. This is a unique opportunity to be exposed to international best practice on the latest energy from waste infrastructure suitable for treatment of residual wastes, and advanced infrastructure for sorting construction and demolition waste, including value-added manufacturing processes for wood waste. The study tour has been designed for decision makers, investors and stakeholders in energy from waste infrastructure. Places are limited in the tour, so early bookings are recommended. A full overview of the tour and how to register is available in the brochure. All meetings and site tours will be supported by Jackson Environment and Planning’s Business Translatorand Engineer in Osaka, MrSatoshi Akaike. Mr Akaike is fluent in both Japanese and English. Should you have any queries, please call the leader of the study tour, Dr Mark Jackson, Director, Jackson Environment and Planning Pty Ltd on (02) 8056 1849 or mark@jacksonenvironment.com.au.